Citizens' groups have been trying to halt the project since 2011, when the Greek government allowed Hellenic Gold, a subsidiary of Canadian company Eldorado Gold, to dig in the region. 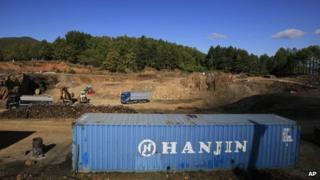 Up to 50 intruders raided the complex at Skouries after midnight on Sunday, fire fighters and police told AP on Sunday. The arson attack caused extensive damage to machines, trucks and containers used as offices, authorities said. A security guard was reported to have been injured in the attack. Police detained 27 people, who were later released. The Halkidiki area has a long history of mining for gold and other minerals, making it the centre of frequent bitter debates between residents and politicians. Eldorado boss Eduardo Moura said the Hellas Gold project would "generate approximately 5,000 direct and indirect jobs in Greece". Authorities hope it will help to fight the crippling unemployment in the region as the country heads into its sixth year of recession. "No-one doubts any longer that northern Greece is a source of mineral wealth, with a total wealth in metals exceeding 20bn euros (£17bn)," Deputy Energy and Environment Minister Asimakis Papageorgiou said in a recent parliamentary debate on mining operations in Halkidiki. "We can no longer accept this being left unexploited or barely exploited." Critics, however, say the mining operation will destroy forests in the area, contaminate groundwater and pollute the air with chemical substances like lead, mercury and arsenic. Opponents argue this will drive away tourism and damage farming and fishing. Last year, residents launched legal proceedings to try and to stop the project. But the country's highest administrative court ruled in favour of Eldorado, citing Halkidiki's high unemployment rate. Judges also said there were no environmental concerns stemming from the investment.